Natalia Varlamova’s graphic artworks are a special universe filled with the spirit of magic, so characteristic of the animation movies. Here every stroke turns into a symbol and every sign provokes a flow of associations. The artist transmits her perception of the world through mighty images which, in her interpretation, acquire archetypal features. The animation movie called "Ayu-Dag" . Based on the Legend of the Bear Mount» was created in the style of naïve art, through which the shamanic spirit shows relentlessly, transforming a nice little tale of the famous mountain’s origin into an exquisite parable on initiation with subtle metamessage within. Varlamova places her characters – bears into a solar mandala covered with mysterious symbols and equals the appearance of the girl to the birth of the soul out of the depth of non-existence. 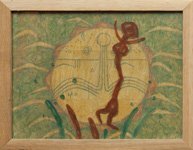 When watching these laconic sketches, which miraculously combine the features of rock painting with refined symbolism, you may find yourself hypnotized by the images so simple in shape and so unbelievably rich in content. Another fine character of a cartoon created by Natalia Varlamova is the Scottish house spirit Brownie . The artist manages to show the ambiguous nature of the creature who terrifies the farmers with his looks while being, in fact, a kind-hearted spirit. Dark tones emphasize the otherworldly origin of the little goblin with tousled red hair and at the same time wraps up the whole scene in a mystic shade, through which, as if through centuries and mists covering Scottish highlands, the pictures of some remote fairy life start coming out. The sketches for the animation movie based on Alexander Blok’s play «Balaganchik» (Little Circus) do not hide their vulnerable decadent nature at all. All the agony and drama filling this non-trivial piece by the great Russian poet bursts through the ostentatiously curved, «lifeless» figures of Pierrot and Columbine, through their frozen face masks, through the exaggerated black shadows of the mystics, who turn into the symbols of the violent upheavals which Blok foresaw at the turn of the century. In «Thumbelina» the artist remains loyal to her inner camertone, which unmistakably paints a tragic, genuinely Andersenian heroine, and her attempts to find her own place in this unfriendly world, where deceivingly bright colors conceal cold looks and unkind intentions of its inhabitants. Each artwork by Natalia Varlamova, whether it is the "Ragged sparrow" by Paustovsky familiar to all the Soviet children or the funny Anglo-Saxon Humpty-Dumpty, is not just a literary character or an interpretation of a well-known story but a daring attempt to penetrate the very heart of the tale, to reveal its deeply hidden truth and open up the gates to the complex and often terrifying world of magic to the viewer. 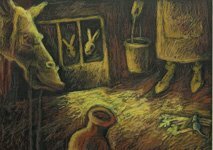 For instance, the classic illustration of K.Paustovsky’s short stories by V. Tsigal paints a picturesque and realistic tale in vivid colors, filled with the optimistic spirit of social realistic art. The black-and-white version of Natalia Varlamova not only deprives the story of the colors characteristic of children’s stories but adds genuine drama to it. Out of the comic curious thief stealing sugar from the little girl called Masha, the crow transforms into a black raven, unsleeping night guard horrifying little city dwellers. Having come through Varlamova’s artistic filters a nice winter tale turns into a gloomy dream of the soul reminding more of «Los Caprichos» by Goya than of a children’s fairy tale. When the character falls into Varlamova’s hands it is subject to grand transformation. The artist does not intend to follow the tradition and will not be content with the superficial understanding. She dives into the very depth, cracking the fragile shell of the story, which conceals the unfathomable intensity of human psyche. Humpty-Dumpty, the egg-creature from the British rhyme, jumping from one tale into another, also acquires mysterious features in Natalia Varlamova’s interpretation. The rhyme turns out to be a complex cosmic story where all the characters are rather ambiguous and look like aliens from a far-away planet while the landscape is rich in unearthly colors, as if emphasizing the illusory nature of the events. In her works Natalia Varlamova does not seek to reflect some objective reality but rather to explore, step by step, the enigmatic Anima Mundi, eternal Soul of the World showing through every little fairy creature. The scale of the creature or the literary piece itself do not matter at all, since the artist is capable of unfolding every aspect by force of her gift only charging it with archetypal power and symbolic depth. Natalia Varlamova's art works can be seen at the exhibition "Variants" until November 20, 2016 daily except Mondays from 2 pm to 9 pm in ARTIME.CLUB at Kuznetsky Most str, h.12, 3rd floor, studio 333.